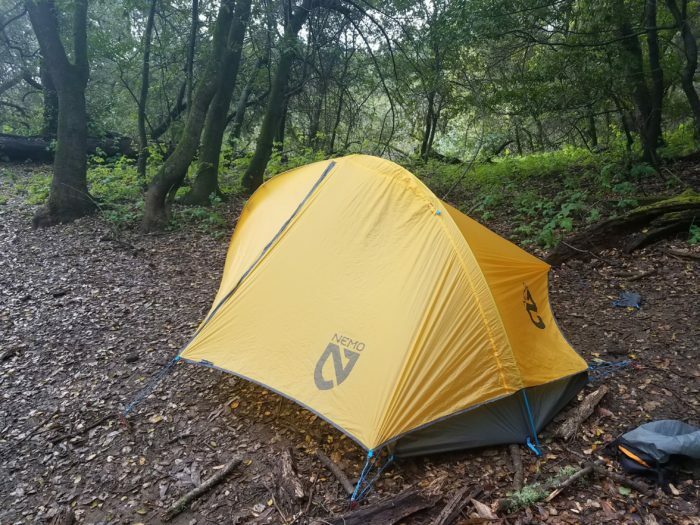 I took the Hornet Elite on a short backpacking trip in the Santa Cruz mountains in California and on a thru-hike of the California Riding and Hiking Trail in Joshua Tree National Park. The Joshua Tree trip was a better test of its merits; besides being generally wet and cold and miserable, there was also a high wind warning in effect the entirety of the time we were there and the tent got a good shellacking. Staking out a tent is difficult in the desert since tent stakes have a hard time latching into the sand and rarely is there something to set up behind that can block the wind for you. Aside from setting up behind a scraggly, knee-high bush and looking halfheartedly in the ten feet around me for rocks to place over the stakes (before giving up and diving into my sleeping bag for night), I didn’t take any precautions to help the tent out, so it was virtually on its own in the conditions. Unlike my neighbors, I didn’t have to re-stake my tent in the night or wake up at sunrise with a tent wall in my face, so I was pretty pleased with how it performed. Ultra-fine 7D Nylon Rip Fly with silicone water repellent: Unfortunately, I never got to use this tent in a real downpour (Unfortunately only for the purposes of this review, if I’m being honest). 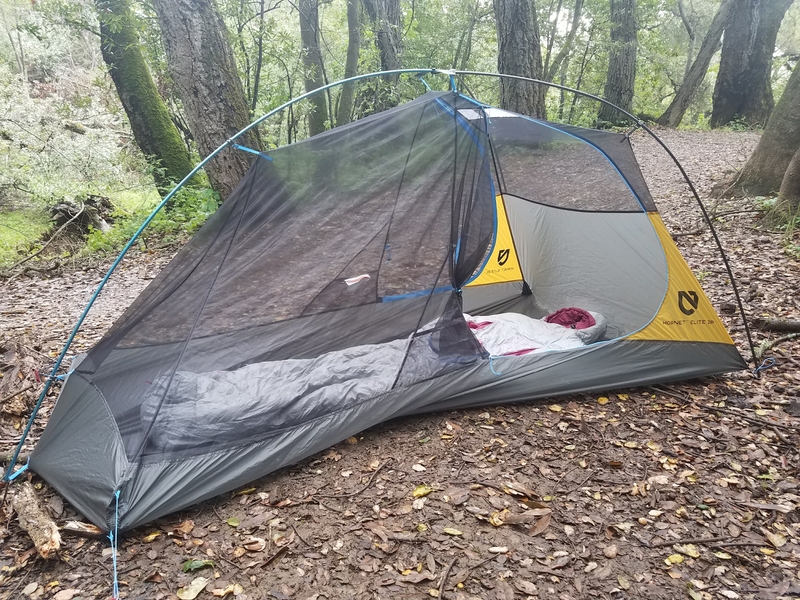 However, the fly got totally soaked in Joshua Tree from all the frozen condensation and I’ve never not woken up to a soaked tent in the coastal redwood forests the comprise the Santa Cruz mountains, so I felt like I got a good idea of how it would hold up while wet. I noticed that it didn’t seem to hold as much extra water weight as other tents I’ve used and it actually dried out some while stuffed at the bottom of my pack all day, which was new. Black No-See-Um-Mesh: This is a great tent if you’re a ditch-the-rainfly-whenever-possible kind of backpacker. You’ve got close to 360 views and since the mesh isn’t some weird neon color, it’s not noticeable while looking out. 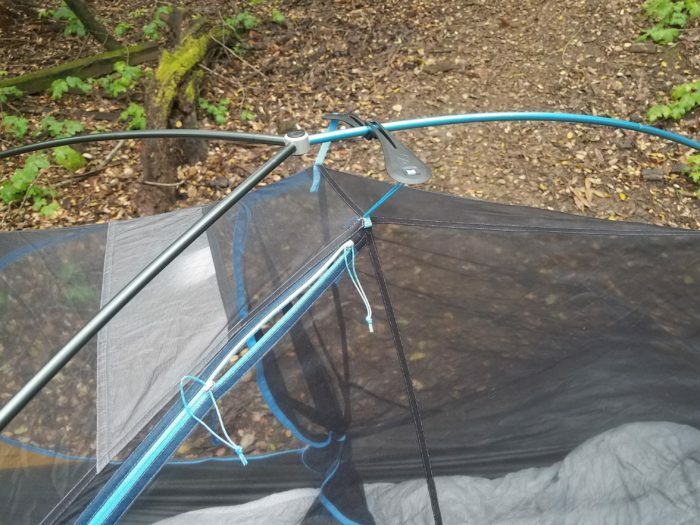 Flybar™ volumizing pole clip: The tent comes with a plastic bar attached to the mesh that connects to the tent pole perpendicularly, spreading out the mesh and giving you some extra head space. It’s similar to the cross bar a lot of tent manufacturers add to their tent pole structures, but simpler to just click on since it’s already attached to the mesh. Light Pockets™: The overhead pocket, usually used to hold a headlamp, is made of light-diffusing fabric to help light up your whole tent. It also includes two side pockets. DAC Featherlite Poles: They felt both light and unlikely to break, which is all you really want in a tent pole. Divvy™ dual-stage stuff sack: The tent comes in a stuff sack that has an extra drawstring in the middle. Should you want to split the weight between a hiking partner, you could just carry, say, the rainfly and cinch the bag in the middle instead of the top. I thought this was kind of a throwaway feature; is it really that different to just cinch the bag at the top? Either way you’re going to be squishing out air and finding another stuff sack for your partner to carry the body of the tent in. Or you could do what I do and ditch the stuff sack altogether because it’s gotta be at least .004 grams, maybe even .005 with that extra drawstring. The Hornet Elite 2p is the second lightest comparable tent currently listed at REI. The only lighter option in a relatively similar price range is the Big Agnes Fly Creek HV 2 Platinum Tent, which costs $50 more and weighs an ounce less. Your most cost-effective way to cut shelter weight—assuming you’re a tent dweller—is to carry a tent that doesn’t use tent poles in its setup, i.e., a trekking pole tent, but trekking pole tents aren’t for everybody. One of my most vivid AT backpacking memories is sitting outside my tent at Overmountain Shelter on a very windy morning and watching a trekking pole tent collapse on its owner. The owner sighed so deeply I could see it through the nylon and he or she continued to lie there, resigned, as the tent fabric flapped aggressively around them. I got the sense it wasn’t the first time it had happened in the night. If you’re one of those people that prefers the security and simplicity of a freestanding or semi-freestanding setup, this is definitely one of your lightest options below $800. At $499.95, you’re still going to have to pay for that weight savings, but it’s far from the most expensive option. The tent is a two-person tent the way a lot of tents are two-person tents, in that it could fit two people in a pinch but you probably wouldn’t want to on the regular. However, it does have a couple of improvements on the could-two-people-not-kill-each-other-in-here front over other two person tents I’ve used. Since the Flybar™ volumizing pole clip does actually add more headroom space (although I would say less space than a tent that utilizes a full perpendicular tent pole), two people could fully sit up in the tent, assuming their heads were directly next to each other. Aside from the obvious benefits of each person having their own door (i.e., not having to step on each other to go outside to pee at 2 a.m.), having an extra 6.2 square feet of space on either side in the vestibules adds to the amount of gear storage space, giving more room in the tent for your actual beings. Having the mesh go all the way down on each side means you don’t have to choose between a face full of unwashed hiker hair on one side of you and a face full of suffocating nylon on the other. It’s still tight. I’ve been in two-person backpacking tents that are actually comfortable to lounge with another person in and this is not one of those. But you will be able to lie next to each other relatively comfortably. It’s one of the lightest semi-freestanding options out there in its price range. The double door and double vestibule setup makes it a more practical two-person tent than lighter, single-door, one vestibule two-person tents. The setup is quick, easy, and feels secure in unfavorable conditions. If you’re less weight-conscious, there are definitely more spacious two-person tents out there at a comparable price, particularly if you are actually planning to put two people in there. There are lighter semi-freestanding tents available if you’re less budget-constrained and cheaper tents if you’re willing to carry some extra ounces. This tent makes sense for someone willing to pay a little extra for a lighter semi-freestanding tent but doesn’t want to absolutely break the bank. It’s probably not the best option for a couple wanting to make it their main habitat on a long trip, but it is great for a largely solo adventurer who wants some extra space and the flexibility to share it with other people on occasion. It is certainly going to become my new go-to two-person tent, as I think it’s is lighter, more spacious, and more comfortable than all the two-person tents I’ve used before. Thanks for the info, Becky!